Self-service data modeling tools like Power BI Desktop, Power Pivot and SSAS Tabular promote the advantage of using data from multiple data sources. 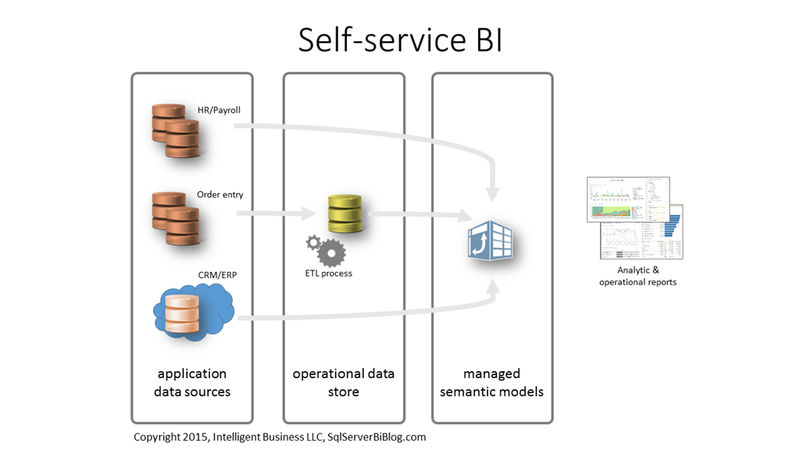 I’m including SSAS Tabular on the “self-service” list because it is derived from Power Pivot and often used for “quicker” IT-managed BI projects. The alleged advantage of sourcing data directly from within the modeling tool might seem to suggest that a formal ETL process and dimensional modeling exercise is unnecessary. 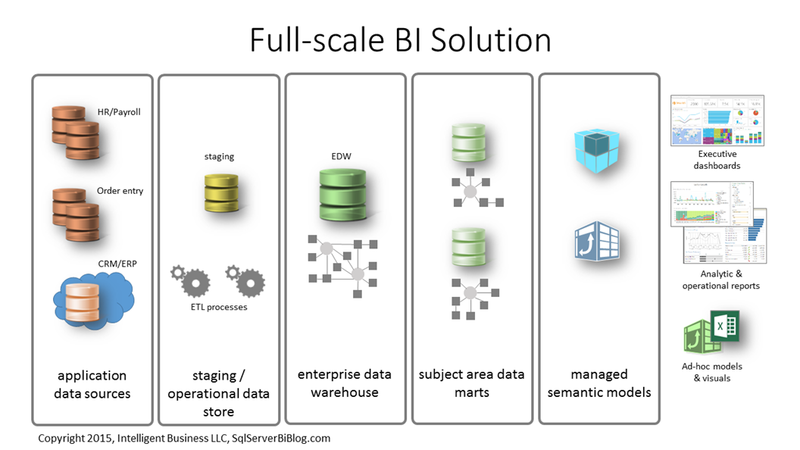 The more experience I gain with these newer tools in business settings has me ever thinking about using best practices and the right approach for scaling BI solutions of all sizes. The bottom line, before getting into the weeds on this topic, is that there are cases where I think it makes perfect sense to skip the usual steps of staging, transforming and modeling data into a relational data mart. Consequently, by using this approach, you are also removing the safety net and limiting options to scale and expand the solution. I love tools like Power Query and Power BI Desktop to develop simple BI solutions quickly. Perhaps a related topic for another time but always consider options to incorporate enterprise scale with modern analytics. Solutions always grow. In less-formal solutions, the “ODS” layer in this diagram may be little more than a small database on an existing server with lookup tables populated by a weekly scheduled SSIS package or stored procedure. A lot of these projects are either departmental or the result of a self-service project handed-off to the IT organization to be “right-sized” and transitioned from the desktop to a server-hosted solution. Power Pivot, Power BI Desktop or SSAS Tabular are often used to mash-up data from multiple data sources. Some of the data may be staged and transformed to simplify a complicated query or to work-around security restrictions from the original data source. The data feeding multiple tables in the model arrives in separate streams where the keys then need to be manipulated in order to match-up fact table keys to identifying keys in the lookup/dimension tables. Here’s a quick overview of the conventional Business Intelligence approach. For the past twenty years or so, we’ve promoted strict dimensional modeling principles that can be summarized in the following diagram. This diagram is my interpretation of The Kimball Method, applied to my experience and tools available from Microsoft. 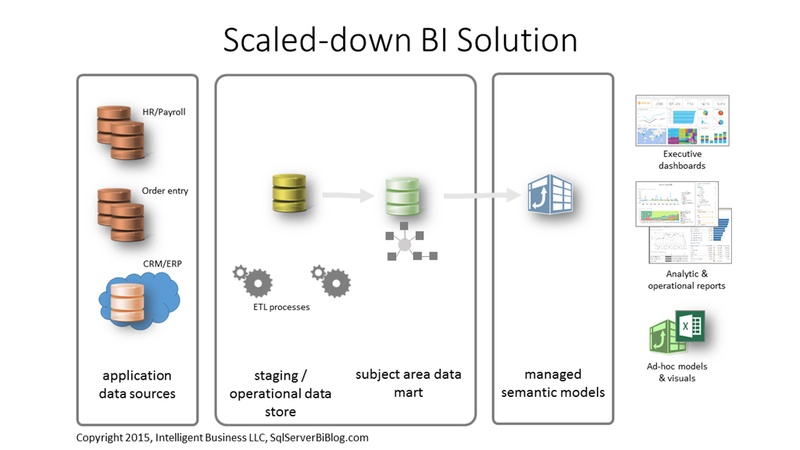 I learned to orchestrate BI solutions using this approach; however tedious, time-consuming and expensive. This is my frame of reference for any BI project. Many variables can influence adaptations from this model such as product choices, big data sources, real-time analysis, data volume, budget or the stakeholder’s realm of influence or ownership – but this is my starting point for a BI project done “right”. If we take this general approach and scale it down to a departmental or business unit level, where an enterprise data warehouse doesn’t exist to satisfy analytic reporting requirements; we commonly end-up with a solution that looks more like the following diagram. Data is still procured from multiple sources through extract and transform processes, loaded into a staging database and/or directly into a dimensional data mart. Even when using an Analysis Services Tabular project to build the semantic model, the model only has one data source with all the fact and dimension tables populated from the relational data mart. The dimensionalized data is then surfaced through a semantic model and then presented through ad-hoc analysis, analytic and operational reports, and executive dashboards. In theory, fixing “bad” or non-conforming data at the source seems to be ideal for everyone. In a utopian setting, the business can incorporate a master data management solution to let data stewards correct erroneous or unmatched records and then feed them back into source systems. Operational reports produced by business applications should match analytical reports and dashboards from the data warehouse/data marts and the models they feed. Please don’t misunderstand – many businesses incorporate MDM solutions and they work well. The reality in most scenarios is that this is a difficult undertaking. It requires business process changes and an enormous level of cooperation and coordination across business units, leadership and interdependent teams. Weeding out bad records and making corrections as data flows downstream to the data warehouse is often a practical trade-off that has many advantages. Reports produced from the data warehouse or data marts should match-up to analytic reports and dashboards fed by semantic models which uses congruent data. Any provisions to compensate for data anomalies within the data model will produce some degree of variation between reports produced upstream and analytic reports produced from the semantic model. This may be acceptable as long as users understand and expect certain discrepancies. Reconciling financial results and auditing to a narrow margin can be a difficult and time-consuming exercise. Often times user confidence can be maintained when the analytic model can produce the same bottom-line figure and discrepancies are evident only in different grouping buckets or categories – like a “catch-all” or “Unknown” member for records that don’t match. SQL Server Analysis Services (which we now call “Multidimensional SSAS”) has handled mismatched keys the same way for several years. When fact rows are processed with key values that don’t match a related dimension, errors are reported and the model processing fails. The developer must make a deliberate exception for these records to match a specially-generated “Unknown” member of the dimension. Under the default behavior, a solution developer following The Kimball Method would have defined Unknown member records in every dimension table and then mapped the unmatched keys in the ETL process. For the purpose of this discussion and as far as we’re concerned; SSAS Tabular, Power Pivot and Power BI Desktop are the same. All these tools, which are derived from different versions of the same code base, all deal with mismatched keys the same way. SSAS Tabular is significantly different from multidimensional in that unmatched fact rows simply flow through model processing and a blank member is generated in each affected dimension table. Visually, this shows up as an aggregated value for an unlabeled heading. Casual users will miss this and won’t notice that a certain number of records have fallen through the cracks. There are currently no properties or settings to change this behavior. In fact, a Connect Item filed back in Feb 2014 was dismissed as a low priority suggestion. I’m not debating the issue but just informing you that this is how it works. I’d personally like to at least have the option to label the blank dimension record as “Unknown”. I’ve found some creative ways to work-around this limitation. The best documented approach is this one that Javier Guillen posted in 2012. One of the reasons I like SSAS Tabular is that it’s simple. But, “simple” means that is has less “stuff”, less “clutter” and fewer features than its more complicated ancestor. I supposed that if every SSAS practitioner were able to get the product developers to add their favorite feature, we might end up right where we started – and that’s a dilemma. This is an over-simplification as there is always room for product improvement. This is a topic worthy of deeper discussion so it’s on the list of items for me to explore in follow-up posts. Please let me know what you think, post your questions and provide some feedback. Posted in BI Industry, BI Projects, Business Analytics, Microsoft BI Platform, Power BI, Self-service BI, SQL Syndication, SQLServerPedia, SSAS Design, Tabular Models. The proliferation of Power BI across the Microsoft ecosystem is astounding and Power BI keeps popping up in the most interesting places like live streaming dashboards in Cortana Analytics and just recently on the Windows 10 desktop. Power BI is so much more than a simple data visualization tool for desktop data and social media streams. With the Windows 10 Cortana integration, you simply ask Cortana a question and the answer is visualized in the search results window above the Start button. Any published datasets you choose are added to the list of all the stuff Cortana checks when you ask her questions. A link below the visual takes you to your Power BI dashboard in the web browser to interact, add fields & filters, change the visual; and pin the results to the dashboard if you like. After that, Cortana integration should show up in your Power BI tenant online. In the settings page, check the “Enable Cortana…” box for each dataset you want to integrate. Interacting with Power BI is now a simple matter of asking Cortana questions that line-up with objects in the published model, just as you would using the Q&A feature from a dashboard in the web browser. 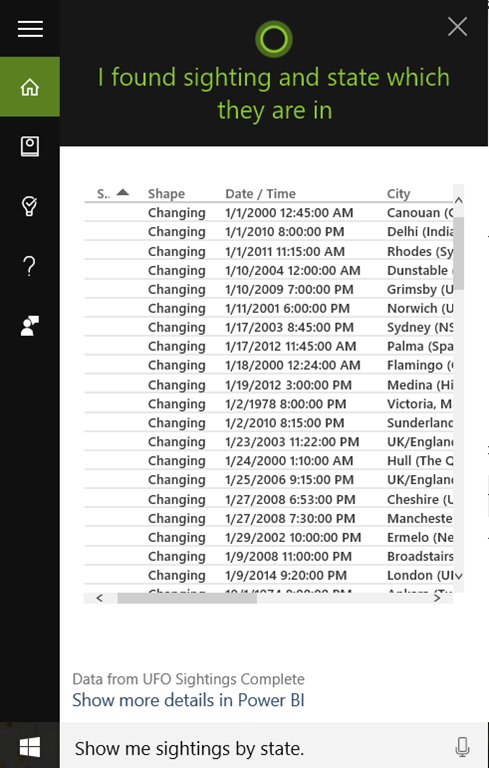 In most cases, you’ll want to navigate from the Windows search results window to the full page view by using the “Show more details in Power BI” link. One of the more effective data visualizations I’ve seen in a while, this animated visual is a time-varying Markov chain developed by Nathan Yau of FlowingData. This is a simulation of 1,000 people’s average day. It’s based on 2014 data from the American Time Use Survey, made way more accessible by the ATUS Extract Builder. Will you be in the Chicago area on March 4th? So will I and you can learn to use Power BI to design real business solutions at my full-day Power BI Hands-On Workshop one day before the Chicago SQL Saturday #484. I’ve delivered this at other preconference events with sell-out attendance. Thank you to all who have attended in other locations. An abbreviated version was delivered at the PASS Global Summit this past November and I’ll be doing a quick two-hour abbreviated session at the PASS Business Analytics Conference this coming Spring in San Jose, CA. Here’s a copy of the entire event description page below. You can register here. This engaging workshop will teach attendees how to use Power BI Desktop to create a complete solution delivering dashboards, self-service and mobile BI. Attendees will learn to analyze information using impactful and interactive visualizations. We will create a solution using a variety of data sources that can be used on the desktop by Data Analysts or for group collaboration in the Power BI secure cloud service. Attendees should have a basic knowledge of database concepts and should know how to use Excel 2013 or newer. 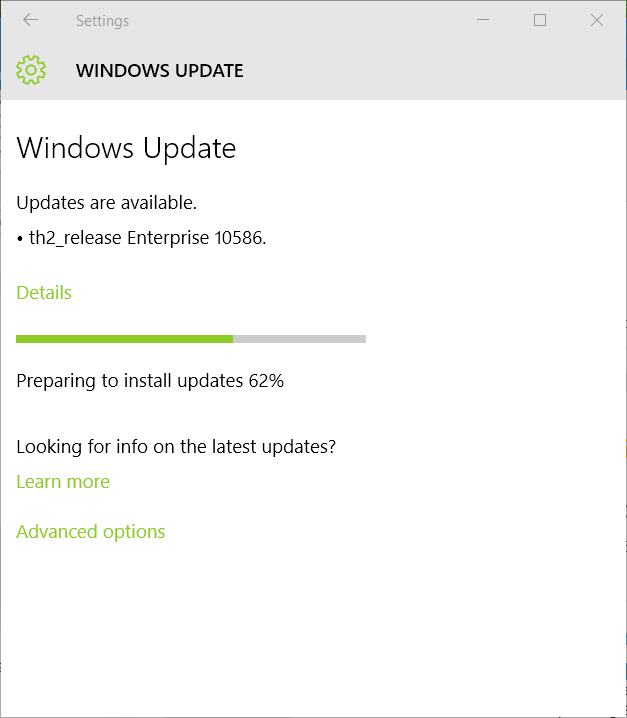 Bring your laptop running Windows 7 or newer (4 GB of RAM is required, more is better, 64 bit OS recommended). Before the session, attendees should download and install the Power BI Desktop and create a free account at PowerBI.com (90% of the exercises can be completed in Power BI Desktop without a PowerBI.com subscription.) 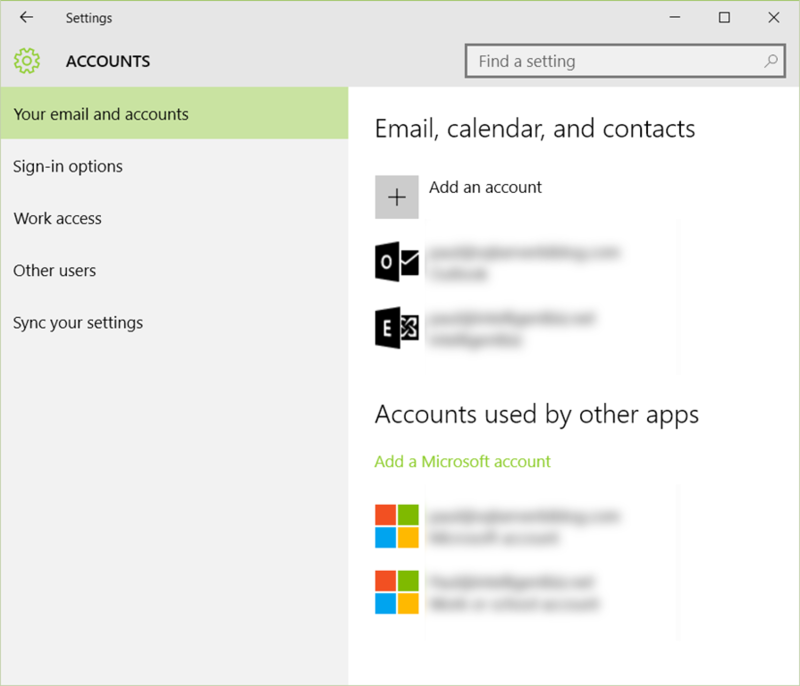 Note that to create a subscription you must use a work email address rather than an address from a free mail provider such as Hotmail, GMail or Yahoo!. If you have any difficulty getting signed up, follow the directions at this post. 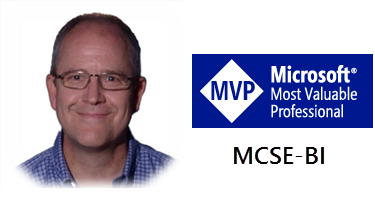 At the conclusion, attendees will know how to use Power Query to combine and transform data from different sources; Power Pivot to model data for reporting and discovery, and write calculations, KPIs and complex metrics. They will learn to use Power BI report visuals to create interactive visualizations and dashboards, and Excel PivotTables, PivotCharts, slicers, conditional formating and advanced features to create collaborative dashboards and reports. Finally, attendees will learn to deliver a collaborative BI solution in Power BI online enabling natural language queries with Power BI Q&A, scheduled data refresh and queries using live, on-premises data. We will also introduce enterprise capabilities which include connectivity to live, on-premises data sources through DirectQuery and Analysis Services. Posted in BI Industry, Excel BI, Power BI, Self-service BI, SolidQ, SQL Saturday.